CattleBoyZ Manufactures a line of Award Winning Gourmet BBQ Sauces that are meticulously mass produced and are being shipped to a variety of North American, and Other Global Destinations. The sauces come in many flavors; can be purchased at Retail Outlets, On-line, in Branded Gift Boxes, Private Labelled, or can even be Custom Labelled for Corporate Events and Promotional Items. CattleBoyZ produces Gluten Free Barbecue Sauces, BBQ Seasonings, and Barbecue Rubs that appeal to modern diets and to bring the unique Alberta savory Sauce sensation to a wider audience. Many known CFIA identified allergens have been removed from our secret ingredient blend to make CattleBoyZ the superior, nutritionally sound Gluten Free BBQ Sauce solution for any meal. CattleBoyZ recently added a line of Premium Quality Pellet BBQ Smoker Grills and Other High Quality Barbecue Products To Our Award Winning Product Line. CattleBoyZ BBQ Sauce is incredibly versatile and has proven to be the perfect condiment. Our BBQ sauces use only the finest all-natural ingredients to create a sweet, tangy barbeque sauce with a spicy kick. 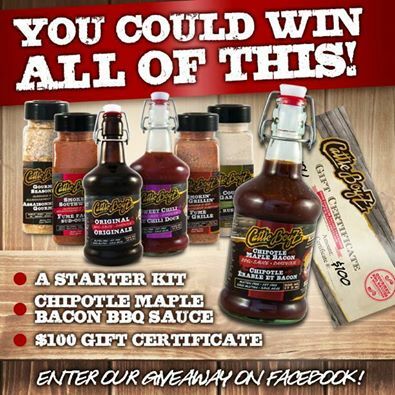 ONE lucky fan has a chance to WIN – 100$ gift certificate, bbq starter kit and latest bbq sauce! Disclosure: All opinions seen in this publication are those of the writer and may differ from your own. A MomPoweredMedia.com team member may have received product or payment as a condition of this publication. No purchase necessary. Void where prohibited by law. Sponsor is responsible for prize fulfillment and shipment to the winner. This sweepstakes is in no way associated with, sponsored, administered or endorsed by Facebook, Twitter, Google, Pinterest or any other social media network. The disclosure is done in accordance with the Federal Trade Commission 10 CFR, Part 255 Guides Concerning the use of Endorsements and Testimonials in Advertising. For questions or to have your product featured on Mom to Bed by 8, email Teri at teri@mompoweredmedia.com. Thank you for the great giveaway. My husband loves to barbeque, so I’m hoping to win this for him. This would be great to win so that I could try out all the different flavours and I know that hubby would be happy with me!